I think we may be getting to the age where having twins, in SOME ways, is easier than having singletons two years apart or so. If I just had one right now, I would definitely be wanting to get pregnant to give my child a playmate, but Adam & Matthew already have each other, and they don't have to wait for a new baby to get old enough to play with them. Of course they are still fighting with each other and stealing. But no more biting (at least none that I haven't been able to stop). they love), but now they are playing back. They will pull the curtain back and say "ahhh" and they laugh like crazy when I pretend to be scared. During bath time they also love to play with the water coming out of the faucet! Finding random places to sit, and then carefully backing up and sitting down. (Our laps, steps, random objects, etc.) Very cute! In the mornings and after their nap, the boys are usually very content to just entertain each other until I come and get them. I try to sneak in quietly to watch them, but as soon as I open the door, they go from looking at each other between the bars of their cribs, to turning/walking towards me with the biggest smiles on their faces. At bed time (not always nap time), when I pick them up to cuddle before putting them in their cribs for the night, both boys now point to their cribs, then themselves, then their cribs, and repeat until I put them in. They are ready for their rest! Occasionally they do something so similarly it is crazy. They other day I had to get one of our cats out of their room during their nap, and I went in, and they were both sleeping in almost they exact position (different cribs). I am surprised by how sad I am that this chapter of parenting my twins is over. The boys were definitely ready to be done, they were only nursing once a day, right before bedtime, and those sessions were only a few minutes long before the boys got distracted and wanted down. They didn't even notice when I took away that last session, they were perfectly content with their sippy cups of milk and their bed time stories. But I'm not sure Momma was quite so ready. 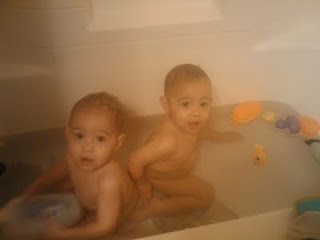 It makes my heart ache thinking how they are not babies anymore, and they don't NEED me at quite the same level. I just read an anti-"cry-it-out" article, so made me want to post a few thoughts. One of the boys woke up from his afternoon nap early today, after about an hour, when they usually sleep at LEAST 2-3. (They are down to just one nap.) As he was crying was actually when I read the article, so I was feeling guilty that he was crying. However, I could tell from his cry that he wasn't in pain, and that he was still tired. When my kids have gotten enough sleep, they wake up happy, and bouncing in their cribs. I also know from experience that once I go in their room, nap time is over. They bounce up with a huge smile on their face (usually also waking up peacefully sleeping brother), and both promptly forget about being sleepy. If they would go back to sleep after I comfort them, that would be my first choice. But it just doesn't happen, and then we all pay for it for the rest of the afternoon with fussiness and tantrums. And whining. Fussiness/tantrums/whining = avoid at ALL costs! 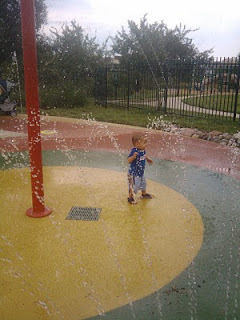 shower after about 15 minutes, and told myself if he was still crying when I got out I would go get him. But guess what? They are both now sleeping peacefully, and we will all be happier this afternoon. And that is why Crying-it-out is not completely evil. It's all about learning YOUR kiddo, and what works best for him (or her :P). T0day while I was getting the boys ready to take their bath, I noticed a bite mark on Adam's back AND on his arm :( Both bite marks had cut through the skin. Or that was my first thought. Then I remembered how much he loves to steal his brother's toys, and it seems Matthew has found a defense against this. In fact as I was reading them their bedtime stories, Adam tried to steal a book from Matthew, and Matthew acted like he was going to bite him. So, Adam put up a hand to defend himself, and I broke them up before it could escalate. We think Matthew may have bitten Adam while they were playing in the play room by themselves, because neither me nor Alan saw the actual bite. I am reading a book that says biting can happen when a child is over-socialized and frustrated. Does it count as over-socialization to have your identical twin (with very similar wants and needs) trailing you everywhere, and wanting your toys? The book suggests a different environment, but I don't see me separating the boys in the house. I think I will just have to be more proactive about not allowing stealing or biting. 3. A discipline problem. We need to nip this in the bud!! There are some days that are everything you always imagined Motherhood would be. Yep this morning was one of those day. Which probably means this afternoon will not be. But that's ok. I am going to enjoy it for now. Me and Adam played the game where he opens the door, pokes his head out, and tries to scare me. A few times I pretended he knocked me down with the door. The last time I was laying on the floor, and Adam walked over to me, sat on my stomach, and then laid on me and gave me a big hug. It was so precious. I skipped nursing them before nap time and they were okay. Yay! (My goal is to get down to 2 times a day (morning and night). Then drop the morning nursing, and just do the night feed until we are all tired of nursing. They seem to love their cup of milk almost as much, so I think we will be okay. 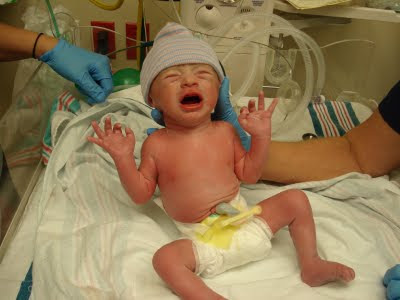 Adam: 22 lbs, 1.5 oz. They are catching up in their percentiles! Matthew is a little smaller than Adam because of his week long illness where he wouldn't eat or drink much except breast milk. The doctor found some old fluid in Matthew's ear, so he did have an ear infection. I have taught the boys a few sings. (Please, All Done, and Nurse) I am not going too crazy with it (mainly because I haven't taught myself very many, I do love the concept of it though). My favorite sign in "please". I say, "say please," and Adam vigorously pats his right hand on his chest, while Matthew barely taps his chest. It is so adorable. Adam especially loves to "say please" even when I don't ask him, if he sees something he wants. One morning the first thing he did after standing up in his crib was immediately do the "please" sign. The hardest part is just trying to figure out what it is they want though. I suppose that would be where more signs would come in handy ;). Run away and laugh, but always look back to make sure I am following them. On the bed or couch, they fling themselves on to their stomachs and laugh, because we often play with them by (gently) knocking them over (on to a soft surface). Play in the mud outside, and then try to hand it to me like it is the best present in the world. Make anything into a phone. ANYTHING. Just by holding an object up to their ear and saying, "eh?" Make car noises while wheeling their toy cars on the floor. Yep we still have our trusty schedule. Yay for schedules! This may apply to all siblings, but my boys do NOT share well. They bite, shove and cry when their twin takes a toy, threatens to take a toy, or has a toy they want. 15 months, as much as I love this age with it's new found independence for both toddlers and mommy, can still be a very needy age. 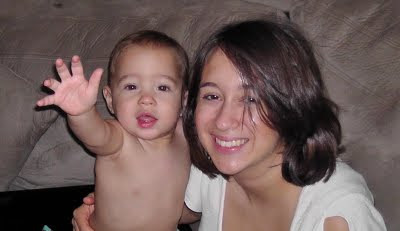 It can still be overwhelming having two sets of hands reaching up and two boys saying "mama, mama". To them they are still the center of the universe, and they don't always realize they have a brother Mom needs to take care of too. A brother with the same needs, and at the same stage of development. Telling them apart can be a challenge sometimes! I feel so bad and worry that I am going to mess them up (as in not treat them as individuals) when I momentarily get them confused. In the morning and after naps, they are always "talking to each other" when they wake up. They are facing each other through the rails and making noises and laughing. Once they hardly acknowledged my presence when I came in; they just continued playing. Too cute. When I send the kiddos outside to play, I often find them playing in the sand box together, or climbing their small gym outside. They spontaneously laugh at each other (actually more so when I am not around, but spying on them through the window :P). And of course, they always have a built in buddy. My kids aren't huge cuddlers. I mean, they love to be held (while walking around) and to be close to Mommy (while playing), but long term cuddling while reading or sitting in a chair? Doesn't happen, not even when they were newborns. Except when they are nursing. At 15 months, we are down to breastfeeding 3 times a day. While they nurse, they are so peaceful and content as they play with my hair, look in my eyes, play little games with me, etc. All while we are seated and not playing with toys (unless I count as the toy). Some of my favorite moments: bath time and story time with the kiddos. :) This was last Friday night. This quote made me smile & laugh. So does that mean toddler twin boys take 100% more energy? Yes they wear me out, but they are the sweetest boys ever. Their curiosity is never ending, they are constantly pointing at stuff and saying, "eh?" or "wha da?" Often they will whine, "ma ma, ma" with their arms up, only to lunge for something they couldn't reach before I can completely stand up with them in my arms. If Adam is anywhere near a stroller or shopping cart, he will try to push it, even if I am holding him at the time. If I sit on the floor with them, they will inevitably end up making their way on to my lap and giving me a snuggle before moving on again. Lately I have been able to let them play in the backyard on their own for 10-15 minutes at a time. (That's about how long it is before they find their way back inside saying, "ma ma, ma ma." That is the perfect amount of time to clean up their highchairs and put some dishes in the dishwasher. I am not able to do a lot of chores while they are awake, but I still try. 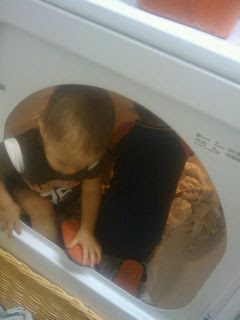 Here are Adam & Matthew while I was trying to do laundry... I was thinking how cute they were standing in the laundry basket, but then I looked away, and looked back, and they were in the dryer :) Little stinkers. It is November, the month of Thanks. I am thankful, so very thankful, that it is so easy to put my kids to bed every night. I don't hear a peep from them after I tell them goodnight and close the door. They are happy through the entire bedtime routine: Bath, Nurse, Story, Bed (Singing, massage). Even when I put them in their cribs; they are smiling up at me. It is precious! Eat, Play, Sleep schedule during the day. But when it was time to sleep, put the baby in his crib, and if he doesn't go to sleep right away, it's okay to let him cry it out. They crying it out should end in 2 weeks. st one deviance would mean two more weeks of crying before nap time. actively doing something about it so I didn't feel as bad. My kids just really hated sleeping I think. Well, after 4 months of crying in their cribs before naps, the mommy guilt really set in, and I changed my game plan a little. I read parts of a new book, "Healthy Sleep Habits, Healthy Child". This book had different levels of strictness that you could follow (For example, you could choose to either soothe your child to sleep every single time before you put him in bed, OR soothe him for a set time, and then put him in bed asleep or not and let him cry if needed.) It said it was okay to nurse your child to sleep, okay to rock your child to sleep, etc, as long as you put him in his crib after he fell asleep to ensure the sleep is good quality. It also advocated putting your baby down for naps/bed at the same time every day. Also it talked more about having a nap time and bed time routine. I liked this book better because it allowed more freedom. I kept the Eat/Play/Sleep schedule because I had been using that for 4 months (I might change that if I had another kid, I think babies like to nurse before sleeping). 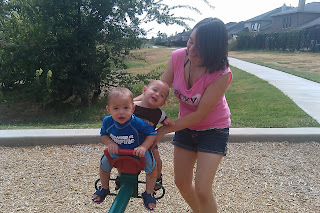 But instead of just putting them in their crib, I started taking them out in their stroller when they got tired. 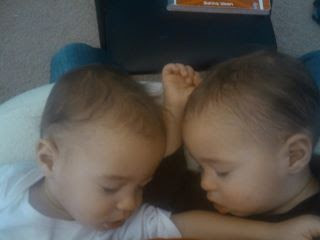 They fell right asleep in their stroller, then I would transfer them to their cribs without a problem. This actually worked really well because they went to sleep without crying, and I got a jog in every morning. 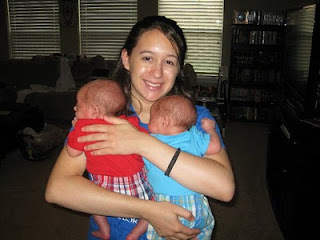 Usually for the afternoon nap, they would fall asleep in the car on the way back from an errand, and I would either let them sleep in their car seat, or transfer them to their cribs. At bedtime they would nurse to sleep. I wonder if this would have worked if I hadn't trained them to sleep in their cribs first, but I was a happy momma when I switched to this method. We were still on a schedule, but without the crying. I started getting worried that after all my efforts in months 4-7, the babies would never be able to fall asleep on their own in their cribs. At 9.5 months, we went to visit some relatives, and I watched my cousin put her two girls to bed. She just read them a story, etc, then kissed them goodnight and closed the door. While they were still awake! No crying or anything. I had a renewed hope that this was possible without crying. When we got back from our trip, I did everything I could to make the bedtime routine fun. I discovered the babies loved full body massages; they would actually lie down for them. I did let the babies cry it out again, but within a few days, they had stopped crying (for the most part), and started going to sleep on their own in the crib. Success! They still occasionally cry at nap time, but only for a minute or two before singing or talking themselves to bed. I don't hear a peep at bedtime. I now nurse before nap time and bed time, but they rarely fall asleep while I nurse. I read them a story, put them in bed, and sing to them while I massage their backs. At nap time they often pop right back up, but I say "goodnight" and close the door, and they understand that I'm not coming back until after they wake up :) Now that they are down to one nap, they often wake up once of twice during their nap. I used to go in, but discovered once I am in their room, they do NOT go back to sleep. Now I wait ten minutes, and only go in after that. They almost always fall back asleep for another 1-2 hours. I wait several minutes at night too when they wake up. Most nights they wake up for a few minutes, but I very rarely have to go in there anymore. WOW, that was a long post, sorry :) In summary, I am so thankful for where we are in this sleep training journey. But I still have some guilt over months 4-7 when they cried before almost every nap time. I wish I could go back and find a different solution, but still have the same result I have now. I think if we have another kid, I will use "Healthy Sleep Habits" instead of "Babywise". I am definitely not against babies crying it out (I think it is needed for some babies...although I don't think it should be used for very young babies), but I now think rocking and nursing babies to sleep is not bad, but actually important for mother/baby bonding, especially those first few months. The two things I believe are most important for good sleep habits are consistency and a schedule. Stick with the method you decide to use, at least for a few months. And a schedule = a must, at least for twin moms. :) I'm thinking singleton moms too? 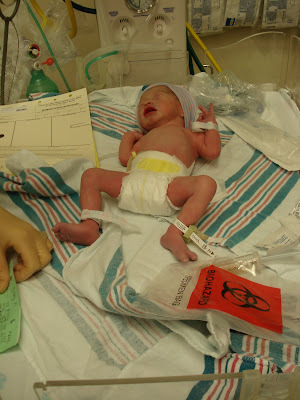 I had my first experience with a really sick baby last week. Not seriously sick, like rush to the emergency room sick. 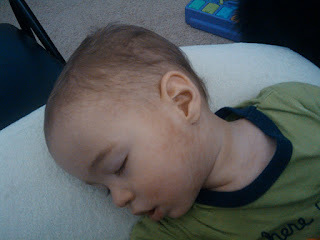 But fever for 5 days (up and down), and sleeping all day (while nursing constantly). This was while we were on a trip to Branson, Missouri. When we returned from the trip, both kids were very clingy, and demanding to nurse all the time (which they really don't do... because we usually have set times for nursing). It's probably because they weren't 100% yet, but I also think they prefer one on one nursing. So does mommy, but it is not possible most of the time! But today as I was nursing them before bed, I took turns resting my head on each of their heads, and we cuddled that way. I really did not realize how many cuddles I was missing out on! I am planning on making that a priority from now on. Both kiddos are back to their normal, healthy selves now, yay! I hate doing chores after the babies go to bed so much, that lately I have been waking up about an hour before the babies get up so I can clean the house. This only works once your kiddos start sleeping through the night :) (At least for me). Actually it is pretty refreshing to get up before the babies. I came up with the idea of having a half-iversary with Alan. May is way too far away for an excuse to have a night away :) So, in November we may have our first night away, woohoo. The kiddos are down to one nap a day just about every day now. So far I like the new schedule pretty well. They tried to do this around 1 year, but then they got sick and went back to two naps a day. We are still breastfeeding 3-4 times a day. But they also get lots of whole milk too, because my plan was to start weaning nursing times, but now they just get both. (Don't think I am producing much though, since I stopped pumping at work). Not sure when we are going to wean. I feel like it was so much effort to get breastfeeding going, I am not in a hurry to stop. We bought little back pack leashes so the boys could have some freedom. It helped me not to worry about them so much, but I think they frustrated Adam & Matthew because they didn't understand what was stopping them from walking further than they wanted. We only rode the carousel and a little kiddie train. Six Flags is not very baby-friendly we decided. Also I finally appreciate what people mean when they say twins go in opposite directions. Speaking of pushing strollers, here is Adam at Target actually pushing the shopping cart on his own (as far as we would let him). Matthew is up top directing. "It Doesn't Get Easier - It Just Gets Different"
You may have heard that saying, "It doesn't get easier, it just gets different." Having 2 walking babies has really made me reflect on the past 13 months. Yes, there are new challenges that come with the territory. 2 walking babies are more work than two crawling babies around the house. 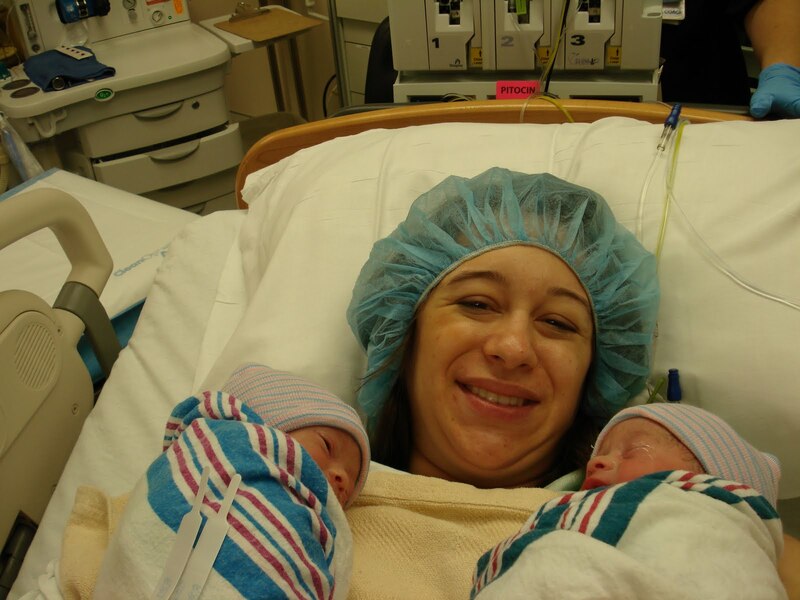 But, whenever I think of the new challenges, NOTHING compares to having two newborns. That was the hardest thing I have ever done, and I'm not sure any of the "different" challenges that happen along our twin journey will compare to the challenges of twinfants. Because we are getting sleep! Some things are harder with walking kids than newborns... such as trying to get them to stay still for a picture. We had a photo shoot with a very talented photographer (hewfly.com) this past Sunday. At one point our photographer asked if we could make them interact. I wish! The boys did NOT do exactly what we wanted (especially not simultaneously), but we managed to get some great shots anyway. 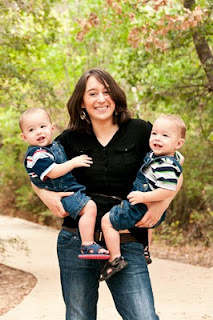 I have so few photos of just me and the two boys it is sad. But following is some of my favorites with them, and the easy/hard aspects of that age range. Easy: You are running on adrenaline. Just looking at your babies' faces makes you so happy. Easy: They stay where you put them. Hard: Still getting to know each other. Babies require constant attention and/or movement. Breastfeeding every 2 hours or less for 12 straight days. 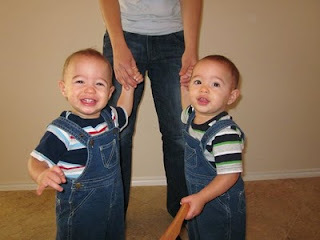 With twins, you have to plan your movement from one room to another; if you leave one alone, he will cry. (I hadn't mastered holding two at once yet). Hard: Breastfeeding every 2 hours or less for 1 straight month. Starting to really feel the exhaustion. Learned how to hold both at once, but they are heavy! Still a struggle to move the babies around the house on my own. Babies like to be cuddled one on one better than both at once. Not taking all naps together. Easy: Starting to space out nursing to 2-2.5 hours. Longer stretches at night. Definitely starting to feel more human. Taking almost all naps together. Hard: Still not sleeping through the night. Getting heavier, but still like to be held a lot. (Really started using the Moby Wrap to hold one baby). Short naps (about 45 minutes). Easy: Starting to sit up and reach for things, which means they can play by themselves for a few minutes! Yeah! This is when I started making real dinners again. Waking up just once a night around 5am, then going back to sleep. (6 months was a huge turning point for us). Hard: Like I said, getting easier every month. Babies love their new independence, but you can tell they want to move on their own. Easy: Started crawling at 7.5 months, which was beautiful! 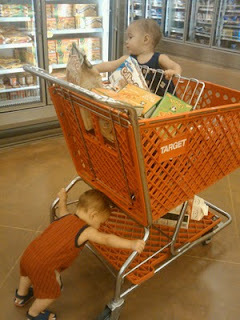 Crawling brought much more ability for them to entertain themselves, so more freedom for mommy! Also the struggle to move them around the house instantly got easier; they loved to follow Mommy! Started sleeping through the night at 9 months. Longer naps. Easier bed times. Hard: Movement means training/discipline. Can't let them crawl just anywhere (in public) due to dirty/uncomfortable floors. Hard: Walking means quicker boys, and there are 2, so have to plan how to keep them safe/contained when I take them on the new outings. This is what has been on my mind. Especially as my husband and I discuss if we want another baby or not. I think a lot of the challenges of the first 6 moths were so hard because we had twins. Nursing at night, cuddling, and holding/moving the baby around the house would be way easier with one, right?? I would just keep that baby strapped to me in a Moby the whole time ;) I keep trying to tell hubby that, but he is not buying. After 5 weeks of practicing (and 3 months of standing in place in the middle of the floor) Adam & Matthew are officially walking exclusively today! Already they are completely different kids. It seems the whole game has changed now that they can walk with stuff in their hands, and reach all kinds of heights while mobile. It also has made them more independent overnight. I have yet to be sad about my babies getting bigger/older. Each stage makes things more fun and interesting. So far :) Okay maybe for the first time I had a twinge of sadness today. The crawling stage is pretty cute. But I am loving this walking thing!! At mealtimes now, I am being offered chunks of food from two little babies at the same time. Both are smiling, just waiting for me to take a bite of their food. But which one to choose first?? When I am cooling off some food for the boys by blowing on it, both kids are also trying as hard as they can to cool off the air in front of them :) It is sooo cute. We love you so much! 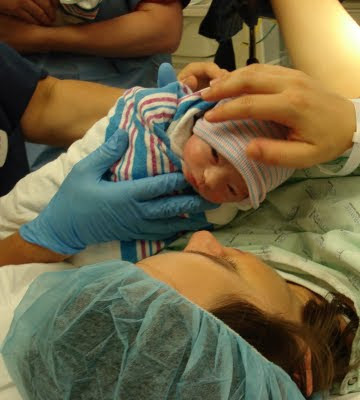 You are our firstborn by 2 minutes, but you don't hold that over your brother's head. You are very sweet and sensitive; you love being held, especially by Mommy, Daddy, Grandma, Grandpa, Grandaddy or your Granny Bee. I secretly think your favorite person in the whole world is your Grandpa. 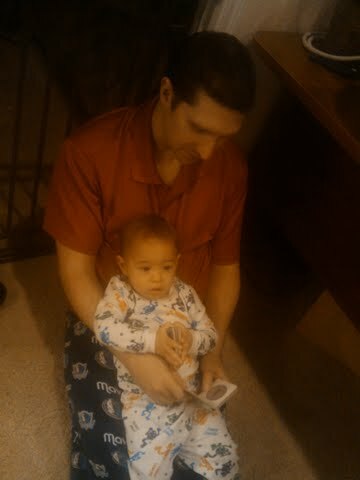 I think you may even like him more than Mommy, probably because he gives you his undivided attention when he comes over! I liked Grandpa a lot growing up too, so I don't blame you! Your career high number of steps on your first birthday was 5 in a row. You love standing up in the middle of the room and smiling really big. We are just as proud of you! Full fledged walking is not far away! You love "talking," "reading" books (you love turning those pages and babbling! ), eating (you almost always eat more than your brother), giving us big kisses, blowing raspberries on our arms and stomachs, crawling with a toy in your mouth and sharing your food with Mommy & Daddy. Just today you were chewing a piece of bread, and you looked at me, took it out of your mouth, and very generously handed it to me! :) Most of all, you love cuddles and hugs with your parents and grandparents. 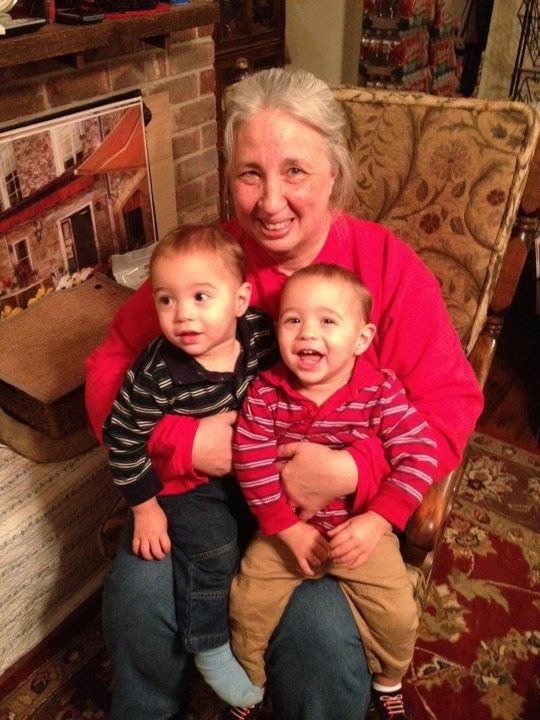 We love you so much. Happy First Brithday! 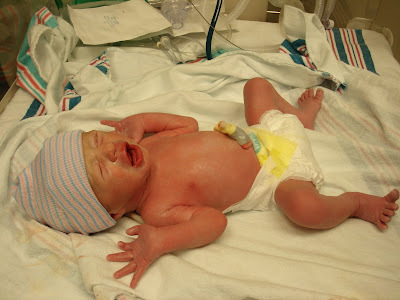 You are a very outgoing and flirty baby. You are ready to give a smile to most people, especially the ladies! Your career high number of steps at your birthday was also 5. Since then you have started taking more, and your new high today is 13. Full fledged walking is around the corner! You love to climb, stand in the middle of the room, flirt, make kissing noises at your parents and grandparents, share your food with Mommy (and laugh when when she takes a bite), "talk," "read" books to yourself, and get your back massaged by Mommy. Adam & Matthew are 1! People ask me all the time how I am able to tell my boys apart. But there are have been times I have had to pause and look, and even some instances when I have gotten it wrong. I feel horrible when I get it wrong. At the same time, their genes are the same, so when they have a difference, I wonder why. But I am very grateful for those differences. I do believe each has their own "look," but that is hard to put in to words. One definite difference is Adam's face is fuller & wider, while Matthew's is longer and slimmer. Another difference is Adam has a birthmark on his upper right thigh, Matthew does not. Their unchanging, proven difference though, is on their right ears. Notice Matthew's "point" on the helix of his ear, where Adam's helix is just smooth. I researched this difference for this post, because I didn't know what to call this "point". Apparently it is called a Darwin's tubercle because Darwin first discovered/named it. Apparently there is a dominant gene for this feature, and it occurs in 10% of the population. Wait. 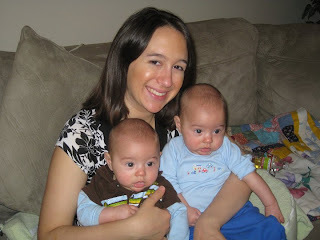 A dominant gene, but my two identical boys don't have the same feature?? Well, apparently this gene has "incomplete penetrance" meaning "those who possess the gene will not necessarily possess the ear tubercle." (All quoted from Wikipedia.) Case in point, my two identical boys with different ears.